This book features eleven common New Zealand native bush creatures. Children have fun solving the rhyming puzzles and questions to learn about the intriguing lifestyles of: kereru, (wood pigeon), fantail, kiwi, kea, stick insect, weta, puriri moth, koura, (freshwater crayfish), cicada, dragonfly and gecko. Each section starts with a narrative rhyming poem that gives clues to the animals’ identities and ends with the inevitable question, What Am I?Turn the page to reveal which creature. 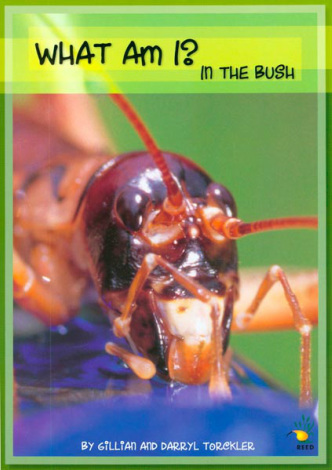 Includes information about the animal in side boxes; details about their life and activities (from the animal’s perspective; and several full colour detailed photography for each. This book brings the bush to life in an interesting way - using poems, narrative, facts and questions to inspire younger readers. The fun text is supported by vibrant photographs. We wanted present information about New Zealand’s bush creatures in an interesting way. In particular we wanted to include some of those common species that sometimes are forgotten alongside those perennial favourites—kea, kiwi and fantail—so we photographed dragonflies, weta, and cicadas I moult in our own backyard. For the cicada pictures, we went out every night for six weeks during the summer we were writing the book. We waited...and waited...and watched. Finally we would see a cicada slowly crawling up the trunk of our chosen tree (chosen because we had previously seen empty shells of skin clinging to the tree). Eventually the cicada’s slow climb would stop and imperceptibly its skin would fracture—in a straight line down its back. Soon the wet, nearly transparent cicada would emerge: head first, then body. Whilst clinging to its own shell the wings would unfurl. Slowly. S-l-o-w-l-y. Two hours from first appearance to flat delicate wings drying under the cover of darkness. Two very captivating hours. "The best of faction and highly recommended"
"The photography and layout are first class and the book is a winner for children aged 6 to 10 years." "Another fascinating book that will appeal to children of all ages - and a few grownups too…A must for every home (even if you haven't got children)…"
"A good way to introduce birds and animals to younger family members - one of the excellent qualities of this is book is that you can take the family for a simple bush walk near most places in New Zealand and find a selection of the birds and insects featured."